Soybean aphid populations have been increasing and fields with threshold level infestations are being treated. Populations in Northwest Minnesota are greatest in the counties of Norman and Polk, MN and in Grand Forks and Walsh counties of ND. It is definitely time to be monitoring your soybean fields for aphids if you haven't already begun. Our crop survey efforts in MN have shifted to soybean. Fields from west central to south central areas have aphids but sampled fields had tolerable numbers below threshold. Fields scouted further north, Norman and Polk counties, have much greater numbers. and there are fields being treated due to threshold levels (250 aphids per plant, 80% incidence and increasing populations). Similar reports are coming from Grand Forks and Walsh Counties from North Dakota. Reports for SW MN can be found at Southwest Minnesota IPM Stuff Newsletter prepared by Bruce Potter, UMN Extension IPM Specialist. Subscribe or follow the link to read his updates. 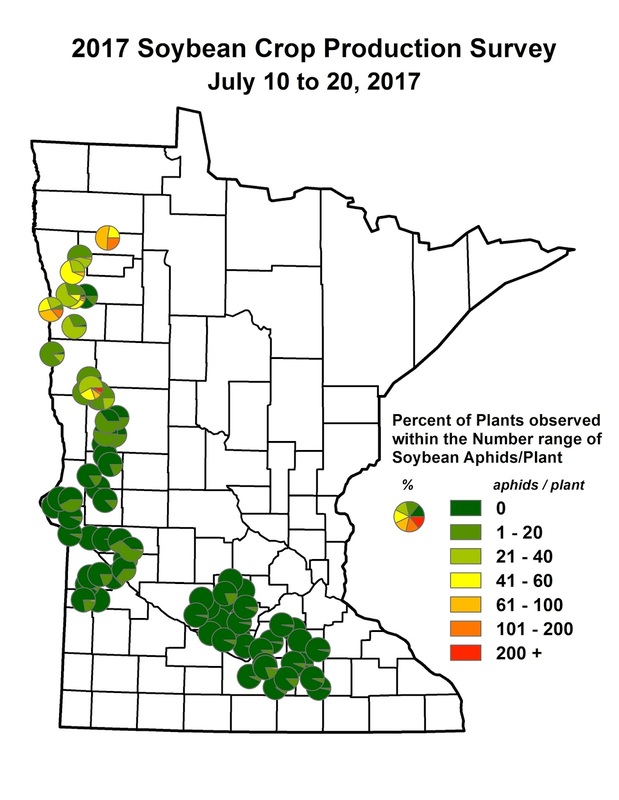 The MN survey map illustrates where aphid numbers were assessed last week. Each pie chart represents a production field that was scouted. Scouts estimate populations on each plant sampled, placing a tally mark in the estimated # of aphid / plant range.The pie chart indicates the % plants observed within a range. Any pie charts that begin to show orange and red indicate those fields had plants with aphids into the 100's. The more red, the greater the percent plants with large infestations of aphids.This map was updated Thursday evening (7/20/17) to include more northern locations. More fields will be added Friday and Saturday. Be sure to scout fields BEFORE making a treatment decision. Avoid the temptation to treat below threshold numbers because it is "cheap", or for convenience or ‘insurance’; this is bad management. Insecticide resistance means management will no longer be easy or cheap. These approaches have put us in a difficult position. You should have heard or read plenty of information this winter about Pyrethroid Resistance in soybean aphid. Insecticide treatments place selection pressure on the population to find survivors. Treating frequently increases the likelihood that you find those survivors sooner. 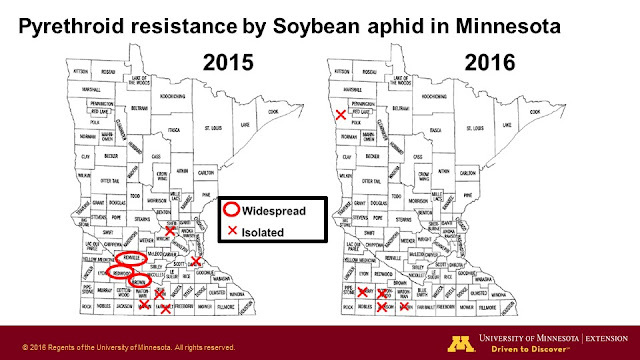 Resistance was documented for soybean aphids in 2013, 2014, 2015 and 2016. 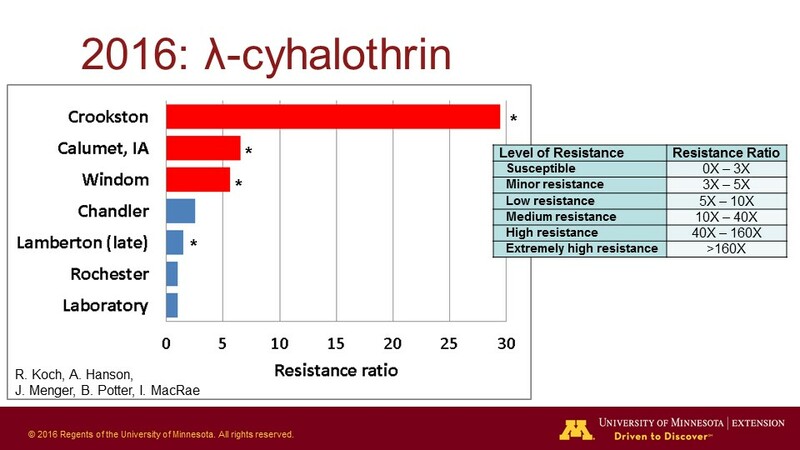 In 2016, fields in Polk County, MN required 4x the bifenthrin and 28x the lambda-cyhalothrin for control when compared to a lab-reared, susceptible colony of soybean aphids. Unfortunately, concerns for 2017 have already been noted in some pyrethroid-treated fields in the valley.